In this post, we check out the best WordPress auction themes. If you’ve landed on this page from Google, chances are you’ve got it in mind to build an e-Bay style auction site of your own. You want to save some money by going with a turn-key solution. Well, listen – one of these themes might help you out. This is currently the most popular of the premium options–it’s available on the CodeCanyon marketplace, and for $19, this is WooCommerce-based auction plugin is going to cover most (if not all) of the bases. It’s got a 2500 users, and over a four star rating, suggesting both the product and the support are exemplary. Another premium solution with a couple of different licensing options. The best free auction plugin for WordPress currently available. Usually in our roundups we note that we selected the themes by hand and, indeed, that was the case this time around. But, in truth, there weren’t many auction themes to choose from to begin with. Of those we turned up, a couple were omitted due to their dated design and limited features. Currently, in terms of design, our favorite WordPress auction theme is Essential by the talented folks at ProspektDesign. Though it works just as well as a straight-up ecommerce theme, the theme supports (and includes) the plugin WooCommerce Simple Auctions to add the necessary auction site functionality. With Essential, there’s also a lot of room for customization and tweaking. Two slider types are provided – one with parallax effects – and the extended options panel allows users to create color schemes, adjust typography, and more. Two different homepage layout styles are also provided. The theme is both responsive and retina-ready, so it’s going to look sharp on even the latest high-resolution mobile devices. Essential is SEO optimized and comes with all of the documentation and demo content you’ll need for a fast and easy install. 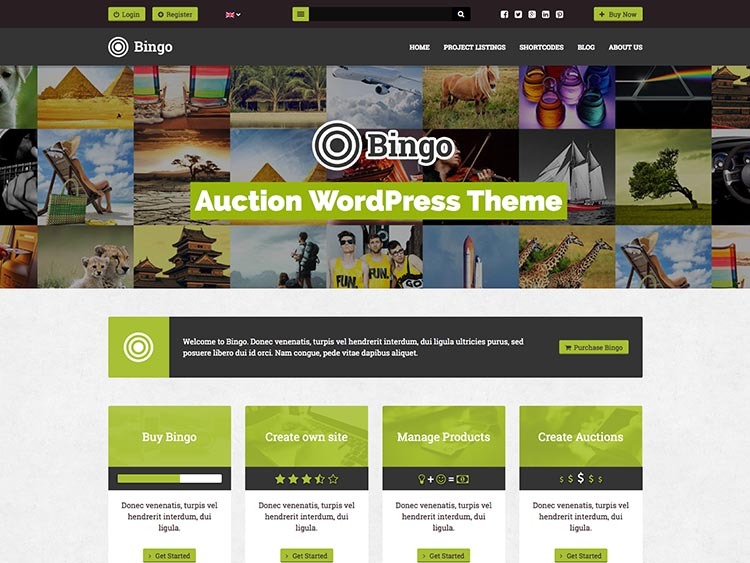 Our second favorite auction theme for WordPress is Bingo by the team at uouapps. 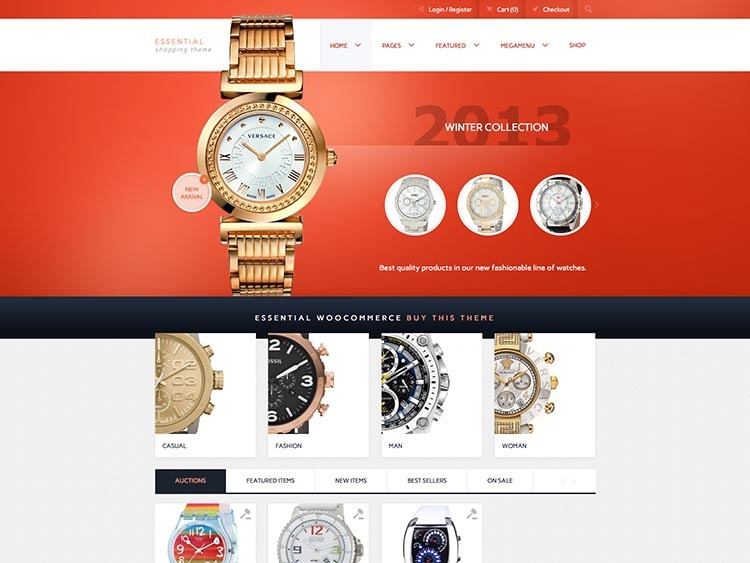 It’s powered by WooCommerce and the WooCommerce Auctions Plugin. The modern, clean design is fully responsive, ensuring that your auction site will look and work great across a range of mobile devices. Features like a drag & drop page builder, a shortcodes generator, theme options, and a variety of page templates increase the flexibility. Bingo is translation-ready and supports the popular WPML plugin. Though we may prefer the design of the previous two selections, SiteMile‘s popular auction theme is the most full-featured solution on our list, and probably the best choice for users who prefer that everything is ready to go out-of-the-box. It also comes the closest to providing an e-Bay style user experience. Instead of relying on pre-existing ecommerce and auction plugins (WooCommerce and related add-ons), SiteMile instead opted to build their auction functionality from scratch, and in a plug & play kind of way. You won’t need to install and configure third-party plugins to get your site up off the ground – this product has everything from private messaging to escrow support baked right in, and we recommend having a look at the product details page for the full rundown. It also satisfies the basic requirements of any modern WordPress theme, like mobile-ready, responsive design and integration with Facebook and Twitter. Recommended. 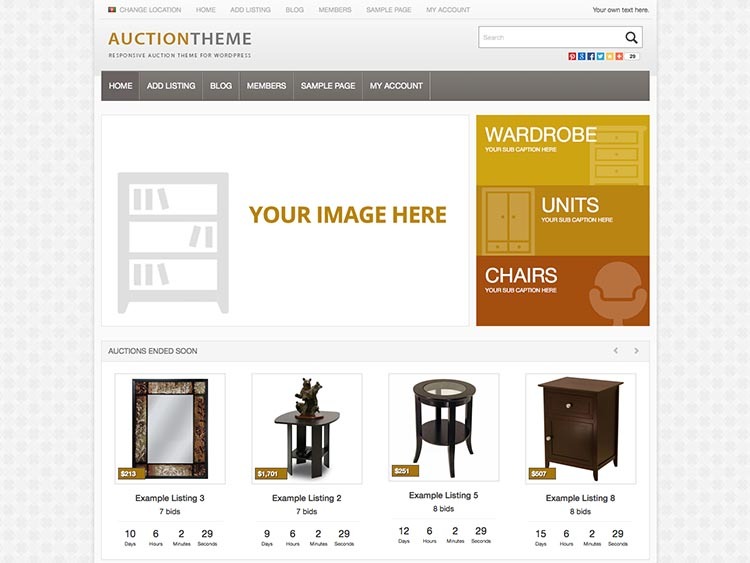 Finally we have the straight-forward, easy to use WordPress auction theme by PremiumPress. Like SiteMile’s theme, this theme also opts for its own built-in auction functionality over third-party plugins, making it a good turn-key solution. The design doesn’t borrow as much from eBay, instead presenting auctions and products in a grid-layout more common to eCommerce websites, but the simple, no-frills style makes it easy to understand and use. All of the necessary features are provided, like reserves, buy-it-now prices, house commissions, and a robust user feedback and rating system. The theme also comes with a drag & drop tool for customizing layout, and a useful options panel for adjust colors, fonts and more. More Info Get It Customized What’s the Best Host? And that wraps up our look at the best WordPress auction themes. We’ll be adding more as they come along. If you know of a solid auctions theme we failed to turn up while researching this article, let us know in the comments. Otherwise, shut up and leave us alone. Haha, just kidding! You guys are all right. what is the best for multi vendor upload for an auction site similar to ebay?